Comments: Why not start the sale offering with lucky number 777!? Love how this one is made - moderate in his skeleton and cool from the side, this easy driving wether takes the guess work out of your next banner. 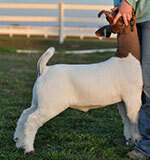 Ditched backed and big ended, he's ready to win your spring or summer county show. Comments: Looking to stand out from the crowd..? Well, there's no way to fade into the background with this one! Make a statement with this stout made red wether. 775 is powerfully constructed, massive butted, and balances up nicely on the profile. 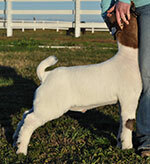 Easy to handle and built to win, let him take you to your next county backdrop. 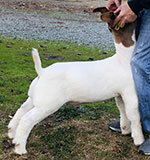 Comments: We lucked out and got a few Gunner sired wethers in the fall, this one had a rough start but he�s coming on quick! He�s perfect in his hip/loin transition, neat in his body shape and handles big and square out of the back of his shoulder. 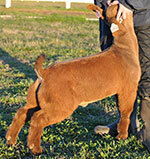 1770 will last through jackpot season, and end well at a May through August show. Comments: Tag 776 is really complete - the easy feeding, well made kind that go on to earn banners. Massive footed and big boned, this square made wether is long and balanced on the profile. 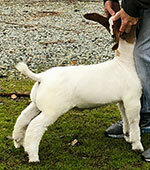 He is bloomy and on track to be competitive at your spring county show! Comments: This could be the the heaviest boned goat on the place, he�s got tree trunks for legs! Not only is he stupid big boned, he�s cool chested square hipped and has a great top and loin in him. 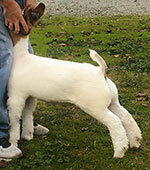 If your in the market for a May/June Fair goat, look at this one long and hard, he�s extremely likable. Comments: Here's the massive, growthy wether of the group. This guy is super opened up through his chest floor and offers a ton of top and center body dimension. 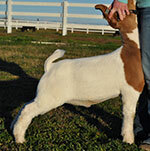 Fast growing and easy feeding, he is well on his way to be ready for an early spring fair. Take the guess work out of hitting that desired heavyweight class with this one. 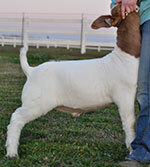 Comments: Last but not least, we bring you tag 761.� Another really solid prospect that's wide and square at the ground, balanced from the side, and offers plenty of muscularity.� He is a maternal brother to the Reserve Supreme Market Goat at the 2017 Santa Clara County Fair, this one is built just the same!